Since the formalization of asset allocation in 1952 with the publication of Portfolio Selection by Harry Markowitz, there have been great strides made to enhance the application of this groundbreaking theory. However, progress has been uneven. It has been punctuated with instances of misleading research, which has contributed to the stubborn persistence of certain fallacies about asset allocation. 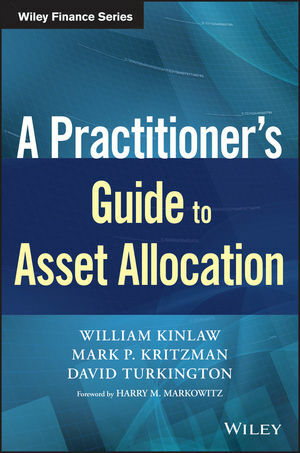 A Practitioner's Guide to Asset Allocation fills a void in the literature by offering a hands-on resource that describes the many important innovations that address key challenges to asset allocation and dispels common fallacies about asset allocation. The authors cover the fundamentals of asset allocation, including a discussion of the attributes that qualify a group of securities as an asset class and a detailed description of the conventional application of mean-variance analysis to asset allocation.. The authors review a number of common fallacies about asset allocation and dispel these misconceptions with logic or hard evidence. The fallacies debunked include such notions as: asset allocation determines more than 90% of investment performance; time diversifies risk; optimization is hypersensitive to estimation error; factors provide greater diversification than assets and are more effective at reducing noise; and that equally weighted portfolios perform more reliably out of sample than optimized portfolios. A Practitioner's Guide to Asset Allocation also explores the innovations that address key challenges to asset allocation and presents an alternative optimization procedure to address the idea that some investors have complex preferences and returns may not be elliptically distributed. Among the challenges highlighted, the authors explain how to overcome inefficiencies that result from constraints by expanding the optimization objective function to incorporate absolute and relative goals simultaneously. The text also explores the challenge of currency risk, describes how to use shadow assets and liabilities to unify liquidity with expected return and risk, and shows how to evaluate alternative asset mixes by assessing exposure to loss throughout the investment horizon based on regime-dependent risk. This practical text contains an illustrative example of asset allocation which is used to demonstrate the impact of the innovations described throughout the book. In addition, the book includes supplemental material that summarizes the key takeaways and includes information on relevant statistical and theoretical concepts, as well as a comprehensive glossary of terms. William Kinlaw, CFA, is a Senior Managing Di? ?rector and Global Head of State Street's academic affiliate, State Street Associates, a unique partnership that bridges the worlds of financial theory and practice. Mark P. Kritzman, CFA, is a Founding Partner and Chief Executive Officer of Windham Capital Management, LLC and the Chairman of Windham's investment committee. He is responsible for managing research activities and investment advisory services. He is also a Founding Partner of State Street Associates, and teaches a graduate course at the Massachusetts Institute of Technology. David Turkington, CFA, is a Senior Managing Director and Head of Portfolio and Risk Research at State Street Associates.